Somehow, garlic bread seems to be the perfect side dish for SO many recipes. It goes great with pastas, soups, even salads. 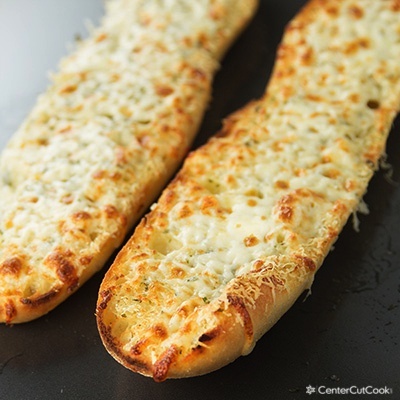 This recipe has just the right amount of butter, garlic, and cheese which makes it the perfect Cheesy Garlic Bread! 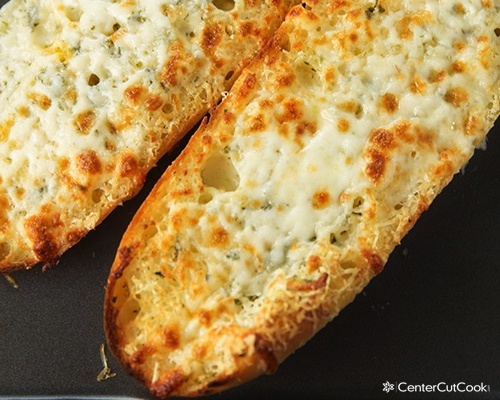 Somehow, garlic bread seems to be the perfect side dish for SO many recipes. It goes great with pastas (like this Spaghetti Pie), soups (may I suggest this Lasagna Soup? ), even salads! You can find some decent garlic bread pre-made at the grocery store, and trust me, I’ve had my fair share of the stuff. However, nothing tastes better than homemade garlic bread! Even better? 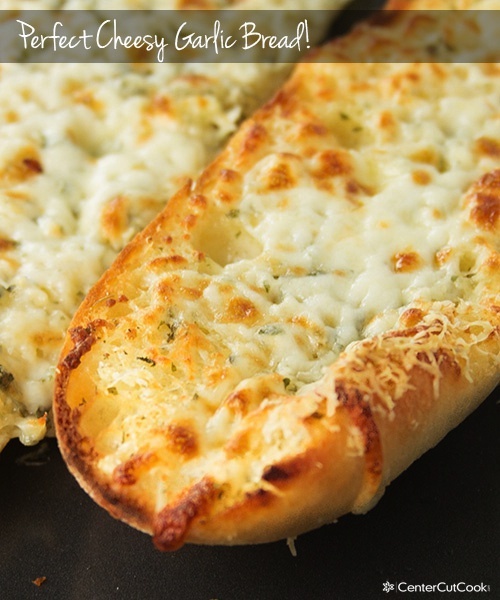 Homemade CHEESY garlic bread. With this particular recipe, I do take a little help from the store and buy a loaf of French baguette or Italian bread from the bakery, but feel free to make a loaf of bread from scratch if you wish. I’ve tried plenty of recipes for garlic bread over the last several years and I’ve finally tweaked one just right to get a recipe that has just the right amount of buttery, garlicy, and cheesy goodness! It comes together quickly, and definitely beats the stuff you’ll find in the freezer section. Enjoy! Slice your loaf of bread lengthwise so that you have two long pieces to work with. Melt 1 stick of butter (1minute in the microwave does the trick). Stir finely minced garlic and parsley into the melted butter. Using a spatula, spread butter/garlic mixture over the bread. Put the bread back together, cover in tinfoil and bake in the oven for 15 minutes. Remove from oven, open bread back up and top with shredded cheese of your choice. Leave bread open faced at this point. If you want crispy garlic bread, turn on your broiler and broil bread for an additional 3 minutes or until cheese melts. If you want a softer garlic bread, top with cheese and put back into the 400 degree oven for 4-5 minutes or until cheese melts.